The event and courses will be set subject to weather and snow conditions. Each racer will have a reverse order second run. Late entrants will run last. Team placings are best 3 of 4 Alpine, 2 of 3 Snowboard times for both runs. On the day we will attempt to facilitate but cannot guarantee that students entered in both Alpine & Snowboarding events will be able to run in both. Ski GS – boy & girl, and Snowboard GS – boy & girl. These individuals must be a member of a team that has entered the minimum number of competing participants. This document acknowledges source material from FIS competition rules. 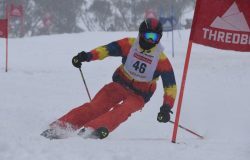 Note that whilst these races are conducted under the sanction of the NSW Ski Association, they are not subject to standard FIS rules. REDLANDS INVITATION RACING is conducted under special rules specifically prepared for the races that it conducts. 1.1. A racer can only be a member of one team. 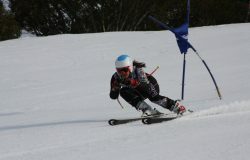 A racer may elect to ski in a higher division. A racer may compete in both alpine and snowboarding events. 1.1.1. Each racer must be a member of a competing team (3-4 Alpine, 2-3 Snowboard) to qualify for the Redlands Perpetual Trophies. 1.2. The team entry must be endorsed by each school’s Principal to certify that all team members are less than 19 years of age on the 1st January and current pupils at the entering school. 1.3. Each team is to supply one adult manager and each school one volunteer official. 1.5. Each division is further subdivided into boys and girls. Co-ed (i.e. mixed gender) teams compete in the boys section. 1.6. All competitors must be less than 19 years of age on the 1st January 2015. 1.7. Team managers are responsible for seeding team members (i.e. race starting order within the team). The order of skiers on the entry form shall be the order of skiing. 1.8. Bibs will be issued only to the TEAM MANAGERS. 1.9. A competitor must carry or wear his/her assigned race bib during course inspection. 1.10. A competitor will be disqualified if he/she does not wear a race bib visibly during competition. 1.11. 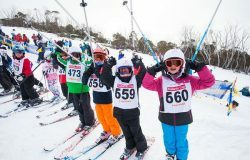 A TEAM will be disqualified if one of its members skis in a bib other than the one assigned to his or her name. 1.12. Bibs must be handed in after the second run on leaving the run-out zone, unless advised otherwise. 2.1 The starting order will be determined by a draw, whereby within Division One, Team One from each school will be drawn first, followed by Team Two from each school and so on. A separate draw will take place for each of Divisions Two, Three, Four and Five. 2.2. The runs will proceed in numerical order of bibs with all the first skiers going through, then the second, then the third, then the fourth. 2.3. The second run starting order will be the reverse order of the original draw for that course. 2.4. The course is available for inspection for ½ an hour prior to scheduled race time. Competitors must wear race bibs. See discipline rules for specifics on course inspection. 2.5. A competitor who is a late entry or late for a start will ski at the end of their Division after acceptance by the Chief Marshall. 3.1 The course will be set by the Resort Mountain Race Department in consultation with the REDLANDS Race Committee. 3.2. A competitors ski tips and both feet must pass across THE GATE LINE (the imaginary line between two poles) of each gate on the course. The racer may cross this line from any direction and may also go into and out of the gates in any fashion, provided the line is crossed. If the course is not completed correctly, the relevant gate judge will record a disqualification next to the skiracers bib number. 3.4. If obstructed during his or her run, the racer must leave the course and report the obstruction to the nearest gate keeper, ski to the bottom of the course within the course fences and report to the Finish Referee. The racer must not finish the course and is not to cross the finish line. A provisional re-run will be noted immediately, and will be valid only if it is confirmed by the Jury at the conclusion of that run. If the claim for the re-run is shown to be unjustified, the competitor will be disqualified. 3.5. A racer must not be physically assisted during his or her run. 3.6. If a racer thinks he or she has missed a gate, he/she may ask a Gatekeeper for advice. 4.1. Racers after crossing the finish line, must turn and show their number to the Finish Referee, then immediately leave the run out zone. 4.2. The run out zone is a dangerous area and must be kept clear at all times. Spectators are forbidden in this zone. Receives assistance in any form during the race. Fails to pass through all the gates by crossing the line between the gates with BOTH feet. Does not wear a race bib correctly. Behaves in an improper way toward members of the Jury, the Organising Officials, Race Committee or Resort Personnel. Loses one or both skis and is unable to replace them within ten seconds, or if he/she comes to a complete stop for over ten seconds during the run, except if a ski is lost in the last three gates in which case he/she may complete the race on one ski without disqualification. 4.4. Disqualification boards will be situated in the finish area. The Chief of Race will list disqualifications during the progress of the race on this board. 4.5. Protests IN WRITING by TEAM MANAGERS ONLY will be allowed for up to 15 minutes, AT THE BASE OF THE COURSE, after the disqualifications have been posted near the finish hut after each run. Protests are to be given to the Chief of Race accompanied by a $50 fee (which will be refunded if the protest is upheld). 4.6. THE JURY will decide on protests by majority vote and its decision will be final. The Jury will consist of: Event Manager, Chief of Course, the Start Referee and the Finish Referee. 5.1. Electronic timing only will be provided. 5.2. For calculation of team results see the specific discipline rules. 5.3. Presentations will take place in the Thredbo Leisure Centre as soon as possible after the completion of the Competition. Each individual must be a member of a qualified school team. Individual racers are not eligible. 5.5. 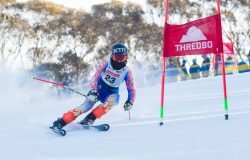 Medals and ribbons will also be awarded to the THREE top placed Australian School teams, both boys and girls, in Divisions 1-6 of Alpine and Divisions 1-5 of Snowboarding. 5.6. 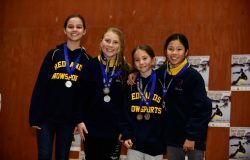 School Teams from outside of Australia (International Schools) are welcome to compete in the Redlands Cup. For the purposes of this competition all International School Team Competitors will be deemed to be International Competitors and will be awarded medals if they place as a top 3 individual or top 3 team along with the top 3 individuals and top 3 teams from Australia. 6.1. 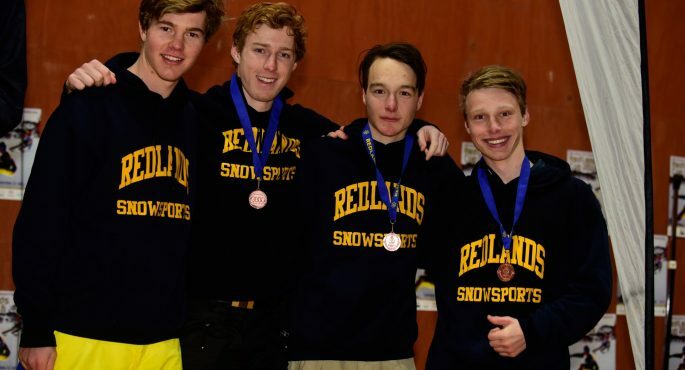 The team consists of a minimum of three and a maximum of four skiers who are enrolled at the same school. 6.2. Each skier will have two runs unless precluded by weather or course condition. 6.3. The team result will be determined by the sum of the fastest three times in Run 1 and the fastest three times in Run 2. 6.4. If a skier does not finish or is disqualified in Run 1, his or her time in Run 2 may still be used to calculate the result. 6.5. Unless there are three valid times for the team in both Runs, then the team is disqualified. 6.6. The course will be a Giant Slalom set suitable for this level of competition. 6.7. Course Inspection may be carried out only by SIDE SLIPPING adjacent to, but outside, the course area or on foot adjacent to the area. Competitors or team managers may not enter onto the course at any time, nor may they ski parallel to the course. Failure to comply with this rule may be. a cause for disqualification. 6.8. For the calculation of individual results, the individual’s time is the sum of the times of two valid runs. 6.9. For disqualification grounds, see previous sections. 6.10. The team consists of a minimum of two and a maximum of three snowboarders enrolled at the same school. 6.11. Each snowboarder will have two runs unless precluded by weather or course condition or incompetence. 6.12. The team result will be determined by the sum of the fastest two times in Run 1 and the fastest two times in Run 2. 6.13. If a snowboarder does not finish or is disqualified in Run 1, his or her time in Run 2 may still be used to calculate the result. 6.14. Unless there are two valid times for the team in both Runs, then the team is disqualified. 6.15. The course will be a Giant Slalom set suitable for this level of competition. 6.16. Course Inspection may be carried out only by SIDE SLIPPING adjacent to, but outside, the course area or on foot adjacent to the area. Competitors or team managers may not enter onto the course at any time, nor may they ski parallel to the course. Failure to comply with this rule may be a cause for disqualification. 6.17. For the calculation of individual results, the individual’s time is the sum of the times of two valid runs. 6.18. For disqualification grounds, see previous sections.